These photos were very kindly sent to me by Gary Schiro, a guest at La Maison de la Vieille Vigne just before Christmas. Gary was very patient with the fact that the cold snap had knocked out the Internet hub at the cottage (and the fact that we had to deal with the dreaded France Telecom – and over the Holidays to boot – in order to get it repaired). He and his partner had no choice but to eschew technology for a while, and instead went for some nice long walks in the snow. This is the Place de la Mairie where the school children were having an epic snowball fight to usher in the start of Christmas vacation. And here is my favorite walk around the Mont Saint Victor in the snow. Merci for the photos Gary. And in about two weeks time Villers-la-Faye will be welcoming five new “Fayavillois” (name for the inhabitants of Villers-la-Faye) when Lisa K. and her family move from Alberta to Burgundy for a 5 month sabbatical at La Maison des Chaumes. Here’s wishing that 2010 is filled with adventures and fun-filled Frenchitude for all my Grape Journal readers. I couldn’t, and wouldn’t, do it sans vous! This entry was posted in Snapshots of French Life on December 31, 2009 by admin. Michelle, you are a very kind soul. I also love how you saw a heart shape in all that chocolate-y mess that was my buche. Here is what a buche is supposed to look like although, like Michelle, I find the restrained version of the buche a bit twee. I’d like to think that maybe the problem with my buche was that I just didn’t have enough plastic gnomes. 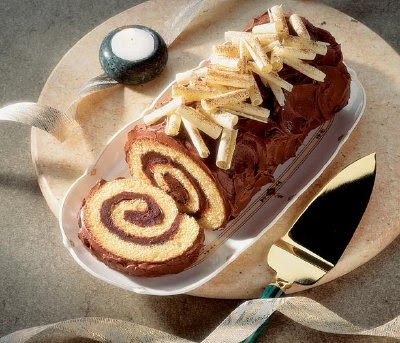 Chef Simon also recommends that the Kitsch OD buche should be eaten while listening to “Motherless Children” by Eric Clapton. Chef Simon is one of that breed of very wise French men. He knows that restraint is a highly overrated thing – especially during the holidays. Allison May, who is living in Beaune for the next three years with her husband and three daughters (parallel lives?) 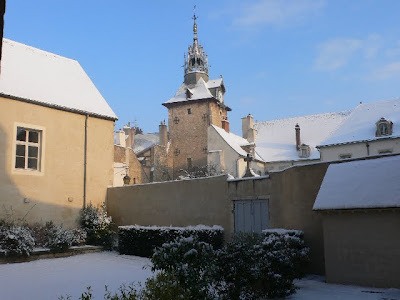 sent me this photo of Beaune this morning under a blanket of snow. Le Beffroi looks especially Old World Christmassy with its coat of white. And here to make your Wednesday just a bit more interesting; a festive Où Sommes-Nous! This entry was posted in Où Sommes-Nous? on December 16, 2009 by admin. The below Authentic France Travel Tips are courtesy of our recent guests Michael and Kathy Jarvis. I LOVE the idea of Francophiles passing on their precious travel tips to other Francophiles via The Grape Journal. Tips can be anything; the best deals on train tickets, restaurant reviews, how to avoid stepping on dog poo in Paris…Just email them to me (you will find my email address plastered all over my website) and I will do my best to spread the word to your fellow travellers. Thoroughly explore the local supermarché. If you choose to eat in your “home”, take the time to cruise all the food aisles before you buy. There’s always a large and acceptable patisserie section. As you know, what we in the States might call the deli counter has an amazing selection of local specialties, like parsley ham, various pates de Bourgogne, and an extensive choice of cheeses, all available by the slice, sized to your request. There’s a section with hot main courses and side dishes “to go”, which are much better than USA takeout. The side aisles hide other packaged, canned or jarred goodies; here is where we found a liter of soupe de poissions. If you like one stop shopping, without the need for much French fluency, this is it; just bring your own shopping bags. Consider the “Pass Beaune”, but do your homework in advance. Discounts up to 15% are available for most of the major attractions. A single pass is good for several days, you choose exactly what you want to visit, and then go on your own schedule. The pass is available at the Beaune tourist office, but it is not widely publicized. I couldn’t have said it better myself. Merci! This entry was posted in Authentic France Travel Tips on December 15, 2009 by admin. Attention anyone who is dreaming of Paris! You know the wonderful vacation rental, L’Atelier des Beaux Arts, just steps away from the Jardins du Luxembourg that I often mention on this blog? Here is my friend Joelle, going to work on her candy apple red scooter, and she is the genius behind it. She has a positively amazing sense of design, and the lucky guests of her L’Atelier can live in Joelle’s gorgeously styled universe for a few days or a few weeks (you’ll be wishing for a few weeks, trust me). Joelle is one of the friends I am thankful to have in my life, at this time of year and during the rest of it too. 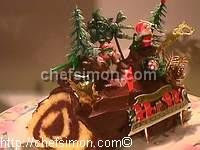 This entry was posted in Burgundy and France Travel Info., Snapshots of French Life on December 14, 2009 by admin.